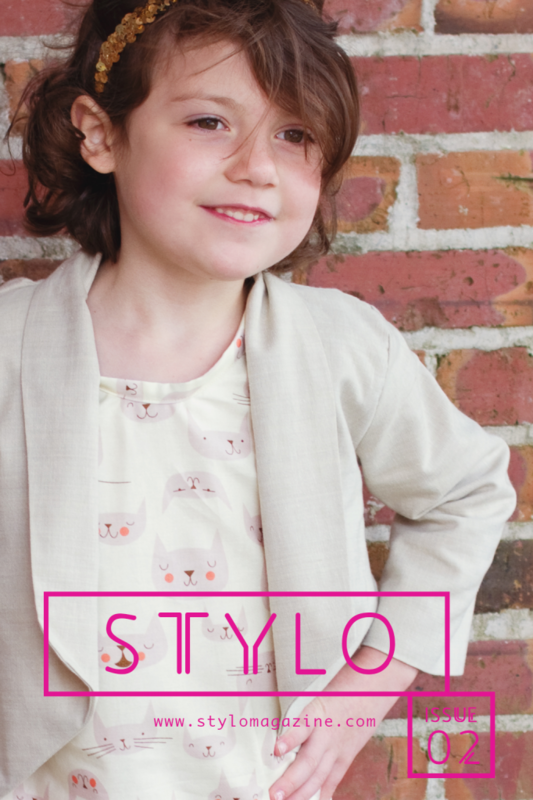 Did you all happen to catch the first issue of Stylo Magazine? If you did, you know how awesome it is. I have some good news! They just released Issue 2 and my girls got to be in this one! 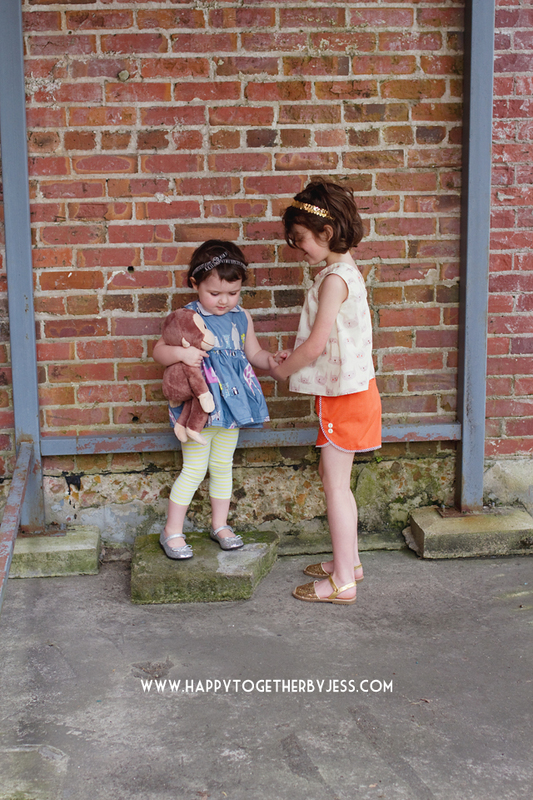 Jessica of The Sewing Rabbit and Celina Bailey of Petit a Petit and Family are amazing seamstresses and are the editors of this online children’s sewing magazine. This second issue features so many talented sewers (I’m sure you will recognize them!) and is full of awesome outfits (with all the details of what sewing patterns they used, what fabrics, where they got accessories, etc.) and many fabulous sewing tutorials. There are also special interviews with others in the sewing industry. Lots of good stuff all around. I made one complete outfit for miss J. I wanted it to be a layered outfit that could be worn in spring and summer. 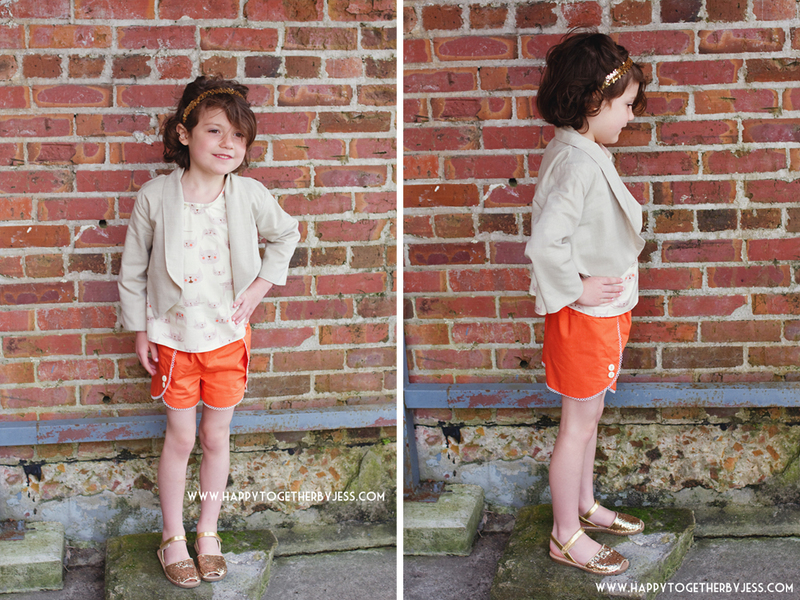 For the shorts and jacket, I used patterns c/o Cali Faye Designs. 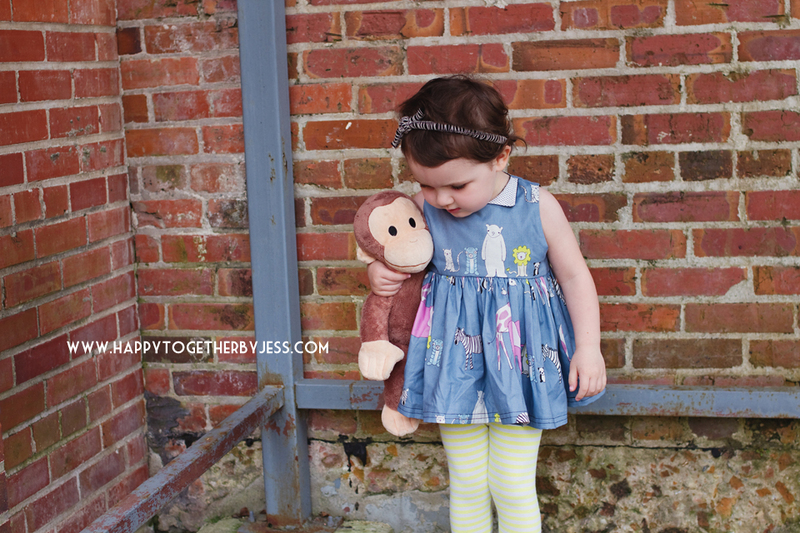 I really love all her patterns and they were really fun to sew. The shirt is a modified version of the pattern c/o 5 and 10 Designs. I have made a few things with this pattern before and it’s so great with all the versatility you get with it. The cat fabric was c/o Michael Levine and I found the matching solid coral/orange color for the shorts at Hancock’s Fabrics and the jacket fabric at Hobby Lobby. I used vintage trim and buttons on the shirt back and shorts. Her gold sparkly shoes are from Target. Which, might I add, I want in my size! Miss E’s top was also made using the 5 and 10 designs pattern. It was actually suppose to be a dress. Yeah. I was a little off on that. She has had some major growth spurts since I last sewed something for her. I put this on her to go take pictures and was shocked that it came out so short! Total fail on my part. But, we had some leggings that went perfectly and pulled out that neon yellow in the fabric. The animal fabric was also co/Micheal Levine and I used some fabric from Hobby Lobby for the collar. The shoes are hand me downs and I used some fancy Lion Brand yarn for her headband. I felt so humbled and honored to be chosen to participate. 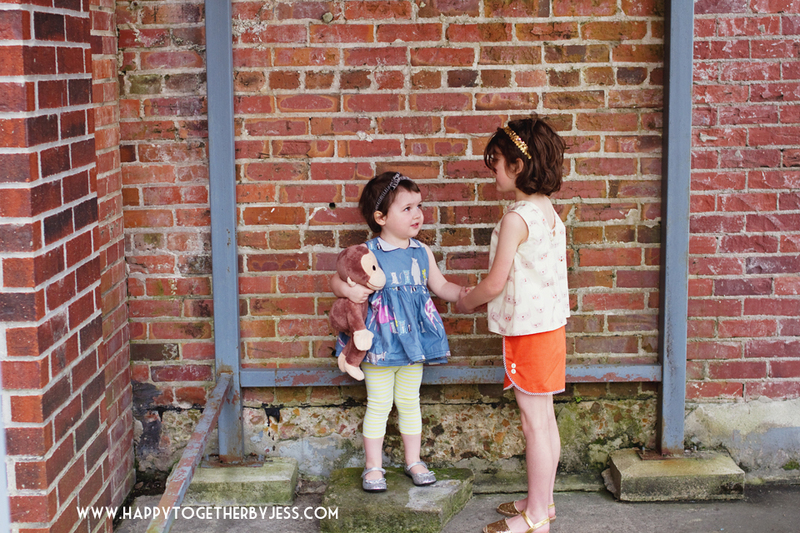 I love sewing for my girls and wish I could do sew so much more for them. It brings me such joy and I love seeing them in outfits that they really like. Where they pick out the fabrics (or at least the main fabric 😉 and then let me create for them. So go on over and check out Stylo Magazine when you have some free time and enjoy! these are adorable! 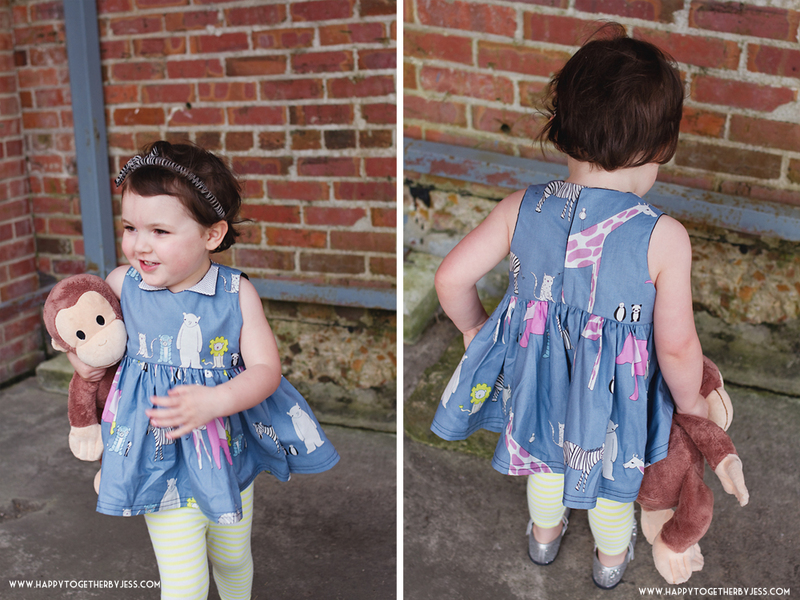 My mom always made clothes for my sister and I, but I’m so jealous of kids these days that get the amazing fabric choices and lucky people like you making patterns for adorable pieces! These outfits are so super cute! I love that they are pretty, stylish and wearable too! Great work.